◊ 18 year old Jake Bugg's debut album 'Mercury'. LOVE IT. Bought by my seventeen year old son with his hard earned money. We get to hear snatches of it – in the car, kitchen and from his bedroom. Some beautiful subdued tracks. ◊ My Autumn staple wardrobe has reappeared: leggings and tunics. Cosy. 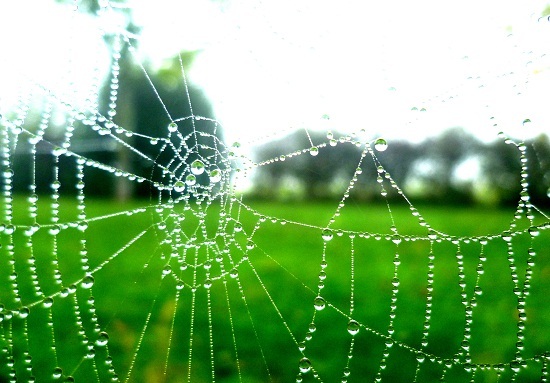 ◊ Love catching sight of dewy spider webs like this one outside our house. ◊ Stunning dip dyed leaves seen on my visit to the Tara Centre, Derby. Joining in with Jen from little birdie in her project to celebrate four simple things that are making you happy each week. I love your spiders web and the colour of those leaves...just divine. Your simple things are just beautiful!